A classic fantasy story from the world's best-loved children's author, Enid Blyton with stunning new cover by Mark Beech. Be whisked away by these magical Wishing-Chair adventures. Mollie and Peter are home for Half-Term, and their magic Wishing-Chair is ready to whisk them away to magical lands! They'll meet brownies, visit the Land of Wishes and even find gold at the end of the rainbow. But best of all, will be helping a certain jolly somebody deliver presents for Christmas! Ho, ho, ho . . . Short chapters and beautiful illustrations make the Wishing-Chair stories perfect bedtime reading for children aged six and upwards. A richly nostalgic offering for grandparents and parents to share with the next generation of Blyton fans. Have you collected all the Wishing-Chair series? Look out for The Adventures of the Wishing-Chair and The Wishing-Chair Again. 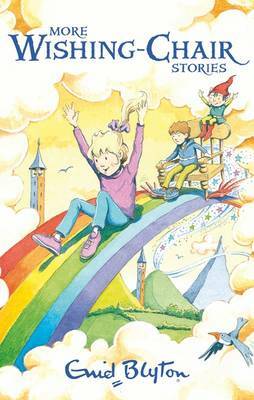 Enid Blyton is arguably the most famous children's author of all time, thanks to series such as The Wishing-Chair, The Faraway Tree, The Mysteries, The Famous Five and The Secret Seven. Her fantasy books, including The Adventures of the Wishing-Chair, are among her most popular creations and they promise to enchant boys and girls for generations to come. Enid Blyton takes her place alongside Roald Dahl, Beatrix Potter, and A. A. Milne as one of Britain's true heritage children's authors.